Discover the essential facts about Marvel Comics' timeless heroes such as Captain America, Spider-Man, and Iron Man, and villains like Thanos, Loki, and Kingpin. Keep up with the ever-expanding Marvel Universe with this new edition of DK's best-selling Marvel Encyclopedia. Updated and expanded, this definitive Who's Who of Marvel Comics reveals vital info and secret histories of more than 1200 classic and brand new Marvel characters, and provides the lowdown on recent key events including Civil War 2, Secret Empire, and Infinity Countdown. From iconic teams such as the Avengers, X-Men, and Guardians of the Galaxy to fan favorites Black Panther, Deadpool, and Captain Marvel to rising stars Amadeus Cho, Squirrel Girl and the Exiles, every significant Marvel character is showcased with the latest comic artwork. 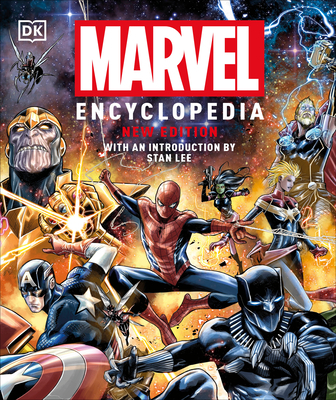 Meticulously researched, expertly written, and stunningly illustrated, the Marvel Encyclopedia boasts newly commissioned cover art by one of Marvel's hottest up-and-coming talents. Including an introduction by Stan Lee, this unique, in-depth, and accessible encyclopedia is an indispensable guide to Marvel Comics that devoted fans and newcomers alike will return to time and again.